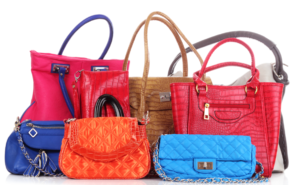 Handbags are one of the most functional accessories in our wardrobes; carrying all our needed (and not so needed) items, and shielding them from the outside eyes and elements; as well as helping to complete your stylish look. From Handcrafted to mass-produced; the handbag is the ultimate commodity loved by women across the globe. 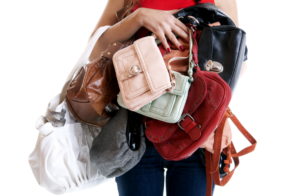 The handbag is loved so much, that once a year we celebrate Handbag Day, and today is that day. Today we recognize the importance of the handbag whether fashionable or functional, and talk about them online and in real-life. It’s a day when the top designers and latest styles are discussed, and the perfect excuse to splash out on that high-end handbag you have been eyeing up, without feeling guilty, or needing to explain yourself. So how did the handbag come to be? It developed over time from the 14th century when women wore purses attached to their girdle, and early Egyptians used to wear pouches that were worn around the waist. By the 1980’s power, money, and logos had a huge influence on the handbag industry, or should I say the designer handbag industry. In today’s market, just open any glossy magazine and you’ll see the importance of the handbag in action, plastered on page after page of ads for Chanel, Louis Vuitton, Gucci, Givenchy, Lady Dior, Yves Saint Laurent and many more. There are many different essential styles of handbags, covering every possible occasion, from the leather day satchel to the evening clutch bag. Here are the 8 essentials that every woman should have in her wardrobe. This is the essential bag to take to the office. Usually with a top handle, of a medium to large size that can hold all of your essential work items. A neutral colour is best, to compliment all of your office outfits. A tailored daytime clutch is a fantastic option for those days when you’re only going to be out for a couple of hours and don’t need to carry many items. This is by far my favourite style of handbag. The crossbody bag is an absolute must-have because it gives you great freedom of movement and is extremely comfortable. Choose one of a medium size with a sturdy adjustable strap. If you expect to have your hands full, this bag is for you. These are the perfect go-to bag, sleek and sophisticated yet practical too. There are numerous different styles and materials to choose from, so let out your own personal style. A fancy evening bag is an essential accessory for all those special occasions. Most of us will go out and buy one to match an outfit for a particular occasion, or you can opt for a more versatile colour and style that will accompany most outfits perfectly. The perfect designer handbag can leave fashion lovers speechless with their truly luxurious feel and timeless iconic shape. Although these bags are on the expensive side, if you’re looking to invest in something truly luxurious, look no further. These bags make a bold statement and will outlast any trend, meaning every woman should have one classic handbag in their collection. Anything goes for this bag; lots of unique, quirky, funky styles to choose from, so let your creativity run wild.